This might just become your favorite malt. 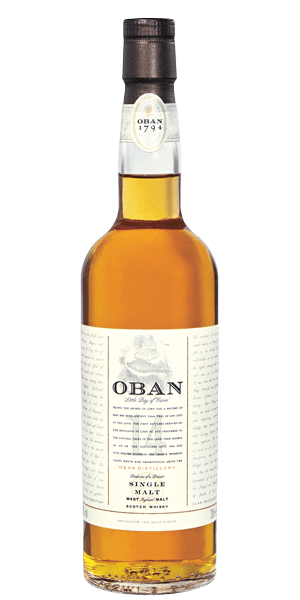 Oban Distillery is found beneath a steep cliff on the West Coast of Scotland in a port town of the same name. In fact, the town was built around the distillery, highlighting the importance of Scotch production to the economy of the day (and probably these days as well!). The distillery itself was built in 1793, making it one of the oldest in Scotland. The malt produced here is the embodiment of the salty coastal surrounds of Oban Distillery itself. The Oban 14 Year Old tells a tale of its seaside home in every sip. Reflecting the rough rocky shores of “The Gateway to the Isles”, this dram is thick with smoke and tangy sea air. If you close your eyes you can perfectly imagine the waves rolling in over the crags and the salt wind blowing through the Whisky barrels. Despite the peated elegance of this malt, it is brilliantly smooth and will become your new favorite malt if you give it half a chance! What does Oban 14 Year Old taste like? The Flavor Spiral™ shows the most common flavors that you'll taste in Oban 14 Year Old and gives you a chance to have a taste of it before actually tasting it. Peat and sea salt, swirling in a fruited caramel body. Citrus explodes out and is complemented with nutty undertones and dashes of vanilla. Smoky peat remains with a slight sweetness. Lightly peated (2-3 ppm) the nose is bright with a caramelized sweet but slightly aggressive fruit. The palate is lacking, some earthy tones, darker flavors that for me where hard to distinguish. No peat till the backend and on swallowing the peat shows it’s face again coming up through The nostrils. The finish is slightly smoky but seemed to lack in other flavor notes. Decent, and a good little initiation into peat, but way overpriced for me to return to. $20/pour, $90/bottle. Great Scotch! A little smoky but I enjoy it more every time I drink it! An excellent go-to Scotch, well balanced between peat and sweet. Perfect balance of peat and caramel. Highland Scotch at its finest. Well. Quite average. Good but nothing to remember. Perfect balance of salty, smoky, & sweet. Great entry level for those not familiar with smoke and peat. Not the most complex single malt out there, but it is delicious and drinkable. A staple in my bar. Got the sweetness a bourbon lover will enjoy, with a little peat in the middle of all the fun flavors. Super enjoyable to drink. Sweet with strong floral and honey notes. Might be a new favorite! Just like it, nothing special to me. A classic in most pubs. Always a good choice. This coastal single malt has been my favorite go to scotch for the last two decades after discovering it while visiting Oban. It was much rarer back then. Oban my first sip and all I could think was OH My! Love it! Fell in love with it the first time I had it. A small amount of peat/smokeness, but not overpowering because there's tons of other flavors too. I own the 18 year but it's not an option to select. A fine scotch, well balanced between spice, smoke and sweetness. For a nice sip by the fireplace. I'm not a big scotch drinker (although I am trying to learn), but I do think that this Oban 14 is very nice. It was suggested to me by a friend as a good entry level scotch as it is not quite so peaty as some of the other scotches. When I am looking for a scotch to stock the cabinet I grab this bottle because I know I will enjoy it. Not the kind of Islay i'm into. A bit floral and rough on the finish. That said, it's good on it's own merit. A hint of caramel and apple. A little bit of smoke, but not much. Also a floral taste to me, and a little bite at the end. A good scotch but very different from my Islays. Obama is a very drinkable whisky. It has a touch of smokey peat but, not overpowering. It has a strong fresh taste that even first time Scotch drinker will like. Oban is one of my favorite whiskys. It’s smooth finish is great. Lots of flavors up front with a perfect ending. Love it. Fantastic all around Scotch and and a good start to the world of Scotch. Light Smokiness with salty finish. Expected more smoke up front. Perfect balance of sweet and smoky taste. Strong and elegant. Must have for the single malt admirers. citrus, salt, light peat. Great stuff from a great place, and the 18 is even better. I'm not sure if I should go 7 or 8 on this. I like it a lot, but I know there are many whisk(e)ys left to try. It's friendly. On the nose, I get orange & lemon and peel, pear. There is a peatiness (medicinal) quality, but it's more fruit forward. On the tongue I can still taste citrus and fruit, but this where I'm getting a touch of the sea. There is a saltiness, and seaweed taste present. I also taste something that reminds me of Honey Nut Cheerios, a sweet cereal, but not overpowering sweetness on the cereal. The first scotch that really caught my attention and convinced me to educate myself about single malts. I’m still learning, but this is my landmark setting my standard. The lingering flavor changes through at least three enjoyable steps until you go back for the next sip - dark fruit and salt middle being my favorite. Salty caramel end finish. I was looking forward to opening this bottle and it most certainly did not disappoint. Delicious. Not a fan of a lot of smoky peat to my scotch but this is the first one that has the perfect amount of smokiness couples with a nice bouquet of flavors. Smooth but not particularly interesting. Fairly limited finish. No complexity at all. If you’re a bourbon lover, you’d probably like this scotch. But drinking it, you won’t really know you’re drinking scotch. One of my favorites, and one of my first bottles down! Our first Scotch Whisky. Wife bought it at Costco because she liked the history story on the label. It was a great choice for our first Scotch. We even went to the Oban Distillery when we went to Scotland. Great tour! Brought home 2 bottles of the Distillers Edition. Great tasting sipping whiskey, One of my favorites when the price is right. A touch too Smokey for me, but a respectable finish. Not a Palate crusher. Mmmm, this is so delicate and tasty. It totally fulfills the promise! My palate is so fulfilled by the tantalizing swirl of smoky flavor. It definitely made it out of the crowd. Not a peat guy, but this convinced me to venture down that tasting avenue. It's not overpowering like Laphraoig, more of a mild peat taste to it. Also smooth, quite like Glenlivet but without the sweetness. Definitely a good boy, not yet perfect. From the start I tasted the citrus, sweet caramel, vanilla, the malt, and oak. Very fruity and super smooth. Liked it so much that I got a few bottles. My favorite single malt scotch to date. Delicate toasted barley/caramel aroma; rich, sweet, smokey flavor - very smooth, long finish. Doesn't quite compare to my favorite Lagavulin 16, but very enjoyable. Briefly sweet and a long smoky finish. Very easy to drink. Not a lot of bang for buck though. Smooth and easy to drink. Enjoyed a lot, one of my daily drinks. Nice smooth flavor ! A little bit to much citrus ! Like an old lover, the memories are sweeter. Nice non peaty scotch that is smooth and easy to drink. Good to share with new scotch drinkers. Immediately getting red apple peels on the nose, with some clover and daisy. Getting honey and dark fruits on the palate with not too much smoke and a dash of sea salt. I find this enjoyable neat and can see this as and any-kind-of-occasion Scotch. Very fruity and sweet, but not syrupy. This would be a good dessert scotch. Not quiet the smokiness of Johnny Walker, but close. I prefer this one over Johnny. Oaky, spicy nose with a lingering sweet velvety finish. Smooth, Carmel, great for sipping and telling stories at camp. Did not like he this one at all. Seemed to have some "off" flavors reminiscent of food gone bad. Fabulous, I tasted it at the Blair Atholl Distillery - wish I had time to stop in Oban to try it in it's home distillery! Got this for my birthday. So good. Smooth, heavy smoke flavor, interesting after taste that lingers. Amazing. Light smoke, Light peat, smooth finish with a hint of sherry. Very smooth, a little smoky & a little sweet. One of the best I think I have ever had, got a bottle from a friend will be buying a new one soon as I finished this one off quickly. My first of the finer scotches. This is the standard to which I compare all others. Worth picking up a bottle. Good amount of sweet, hint of smoke and oak. Nice finish. A great dram from one of Scotland's oldest distilleries. Great coastal flavors.